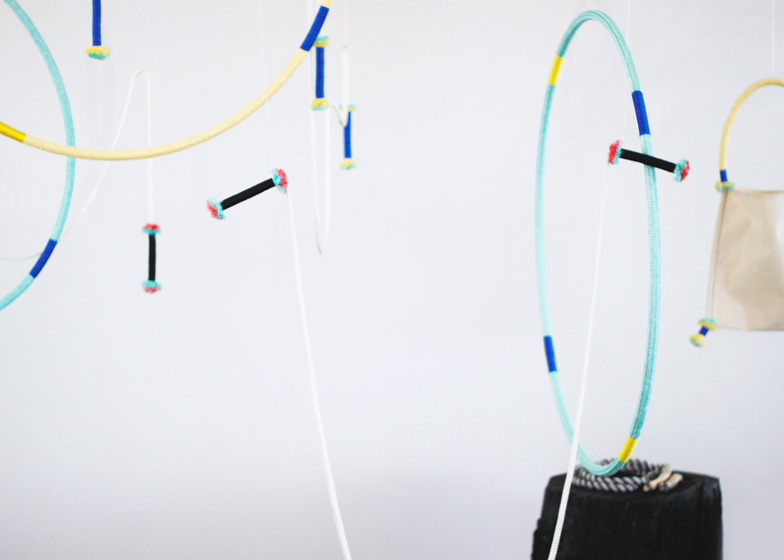 DesignMarch 2015: net-wrapped hula hoops and skipping ropes with reindeer-antler handles are among pieces created by four Reykjavik-based designers to highlight the hundreds of tonnes of rubbish washed up on Iceland's coastline each year. Icelandic product designers Thorunn Arnadottir and Dagný Bjarnadóttir, ceramicist Kristbjörg Guðmundsdóttir and Finnish graphic designer Milja Korpela contributed fishing-themed products to an exhibition called 1200 Tons, which took place during the DesignMarch festival last week. The exhibition title was taken from the amount of marine waste that accumulates on Iceland's shores as a result of the country's fishing industry. Volunteer charity Blái Herinn (The Blue Army) collects this litter from the shoreline. Set up by ex-diver Tomas Knútsson 20 years ago, the organisation has so far retrieved over 1,200 tonnes of rubbish – including old fishing nets, batteries and car tyres – dredged from the North Atlantic Ocean that surrounds Iceland. The exhibition aimed to highlight this issue and to show how some of the waste materials could be recycled into new products. Arnadottir created her Sipp og Hoj! (Skip Ahoy) set of colourful playground toys as a result of a net-making workshop at a local school. Skipping ropes, hula hoops, bags and keychains are bound in brightly coloured netting material. Reindeer antlers and lamb bones were also incorporated into the collection, "bringing together elements from the land and sea in east Iceland," explained Arnadottir. Variations of the skipping rope feature frayed and tufted ends. The hoops and ropes were suspended from the ceiling of the exhibition space, while seats by Bjarnadóttir formed from driftwood stumps bound by lengths of worn braided cord were presented below. This collection follows on from an earlier project by Arnadottir, where the designer collaborated with local practitioners in east Iceland to explore the possibilities for small-scale design and production, using locally sourced materials and existing skills. Also presented at 1200 Tons were Guðmundsdóttir's range of porcelain bowls and lights moulded from a series of buoys – the coloured floating spheres used as markers in the sea. Splitting each buoy in two, the designer used the hemisphere to create large bowls that are glazed on the inside, but left rough and marked with indentations from the moulds on the exterior. The bowls have rounded bottoms, so were balanced on turquoise rings used to give fishing nets buoyancy in the water. A stack of wooden palettes, often used to move produce in the fishing industry, created an exhibition plinth for the pieces. Guðmundsdóttir cast the buoys in a very thin porcelain to create pendant lampshades that allow the LED lights to illuminate the spheres. The Globe lights were strung on lengths of rope from the ceiling of the exhibition space. Posters aimed to present pollution figures from Blái Herinn were created by 1200 Tons curator and designer Korpela. She used a series of pastel-coloured infographics with abstract patterns to make the facts easy to understand. "I decided not to show the cold reality, but to make it more approachable," explained Korpela. "That's kind of the idea, to make something out of this horrible fact." Korpela also produced a range of patterned cushions with covers made from coloured cotton and PVC. The graphic patterns are based on international marine flags, which are used to indicate weather conditions and to send warnings and messages between ships. "I used the materials that are used in the marine industry and that are durable, like PVC that they use for covering the ships," Korpela told Dezeen. "The patterns are inspired by the international marine signals but I interpreted them in today's colours." The exhibition space will be converted into a fish market and cafe as part of a larger regeneration of Reykjavik's docks, opposite the luminous honeycomb structure of the Harpa concert hall. Photography is by Íslenski Sjávarklasinn, Kristinn Magnússon and Milja Korpela.